Before that day in the MoMA in 2011, I had seen images of Mark Rothko's work in textbooks or online and was underwhelmed. But on that trip to their Abstract Expressionist exhibition, I saw Rothkos physically before me for the first time and was mesmerized. Rothko himself wrote about the importance of the size of his work, saying "I want [the paintings] to be very intimate and human. To paint a small picture is to place yourself outside your experience, to look upon an experience as a stereopticon view or with a reducing glass. However, you paint the lager picture, you are in it. It isn’t something you command. "And to stand before his work truly is to experience the painting, a point that is nicely illustrated further in this short essay. Mark Rothko, No. 16, 1960. Oil on canvas. Aside from the huge benefit of seeing Rothko's work in person, I also gained a much better understanding of his craft from quotations of his on the MoMA's wall panels. One of them brought a lump to my throat: "Often, towards nightfall, there's a feeling in the air of mystery, threat, frustration—all of these at once. I would like my paintings to have the qualities of such moments." Suddenly the colorful blocks of color that seemed so arbitrary in my art history textbooks enveloped me with memories of my childhood, of dancing in my grandmother's yard and catching fireflies at dusk; of sitting with my body half freezing and half warmed by a bonfire at summer camp; of leaning out of my bedroom window at night and wondering about the life I would lead. A bolt of emotion hit me. Somehow the artist himself giving me permission to feel the mood of his work rather than trying reason the logical explanation for it opened a new world for me. And I've been a Rothko-lover ever since. I'm only including a few process photos here because this is a somewhat avante-garde look that's new to me, so I had to be highly aware of each move I made in creating it; thus, I didn't take the time to photograph every step. I had a lot of fun working on this, and I hope you enjoy the process along with me! 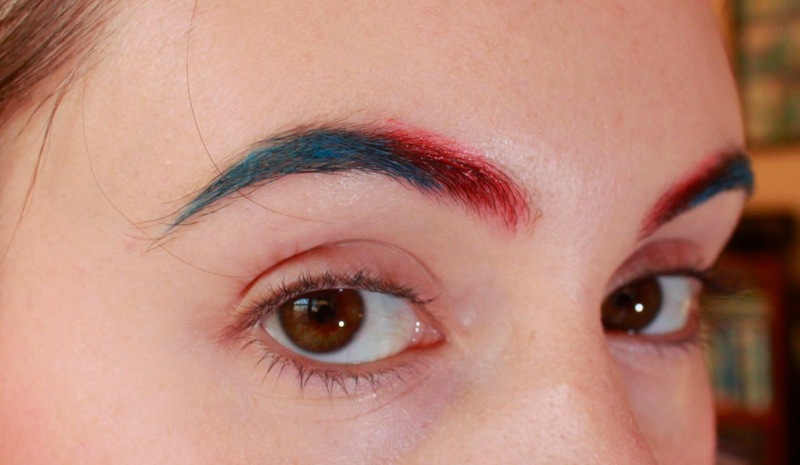 Since my eyebrows are quite dark, I started by coloring them in with a pencil (the NYX blue on the outer 2/3) and a cream blush (the Revlon Coral Reef on the inner 1/3) to make the final effect as opaque as possible. I also made sure to prime my entire eye area well. 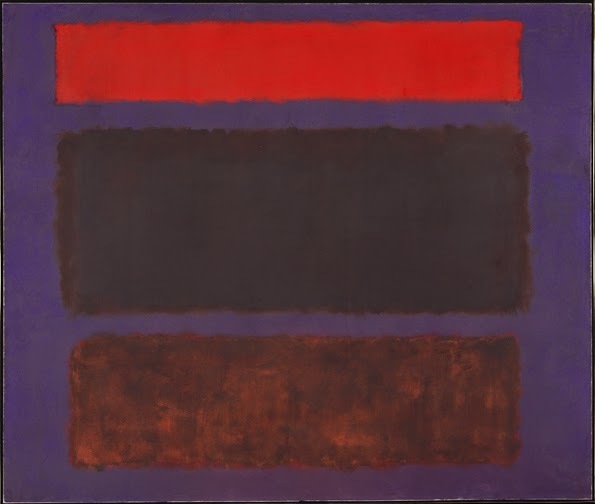 I spent a long time thinking and testing out ways to translate the uneven borders of Rothko's blocks of color, in which he makes no effort to hide the brushstrokes. It's one aspect of his work I love, yet also one I knew could look really sloppy and unintentional in makeup form if I wasn't careful. To combat this, I decided to make the outer edge of the eyes very sharp using Scotch tape, mimicking the actual border where the canvas meets the wall. And then, I just began to play with shapes! I used a brush, seen below, to apply Inglot's gorgeously pigmented gel liners as cream shadows. 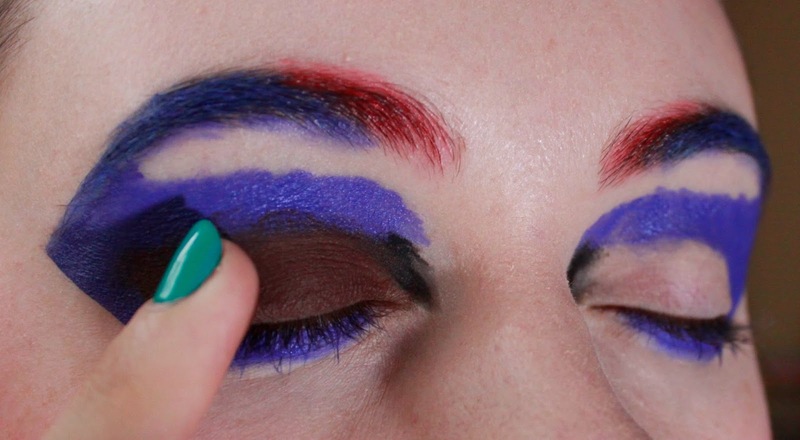 I also felt that I couldn't just draw rectangles on my eyelids; a flat canvas is a very different surface to start with than a face, and I couldn't reconcile ignoring that fact. 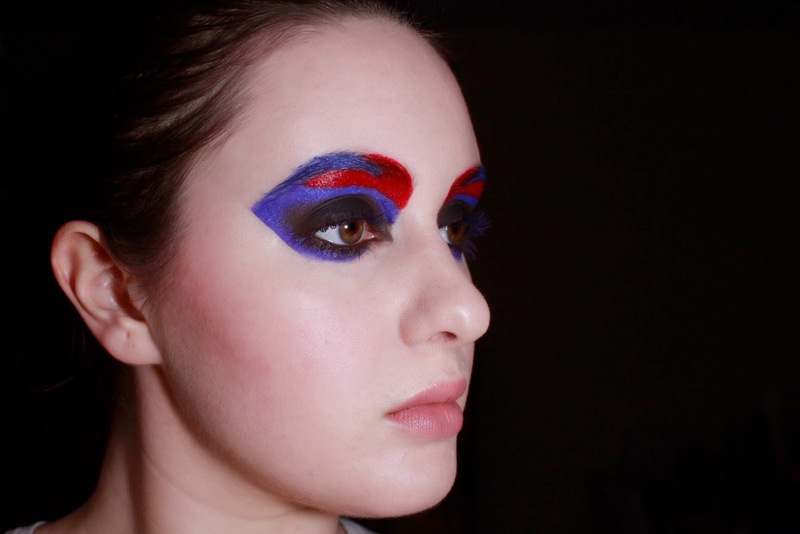 So I did modify the blocks of color on my face, letting the red become more of a V-shape and letting the blue be more of a fluid border than a strict rectangular border. 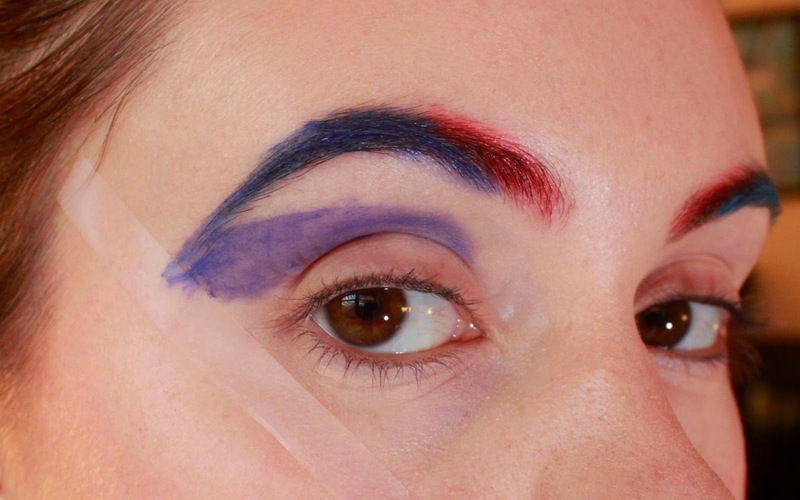 I mapped out the end point of the brow/black area with Urban Decay's creamy black liner first, and then went over that area with Maybelline's brown gel liner, just using my finger to press the color in. 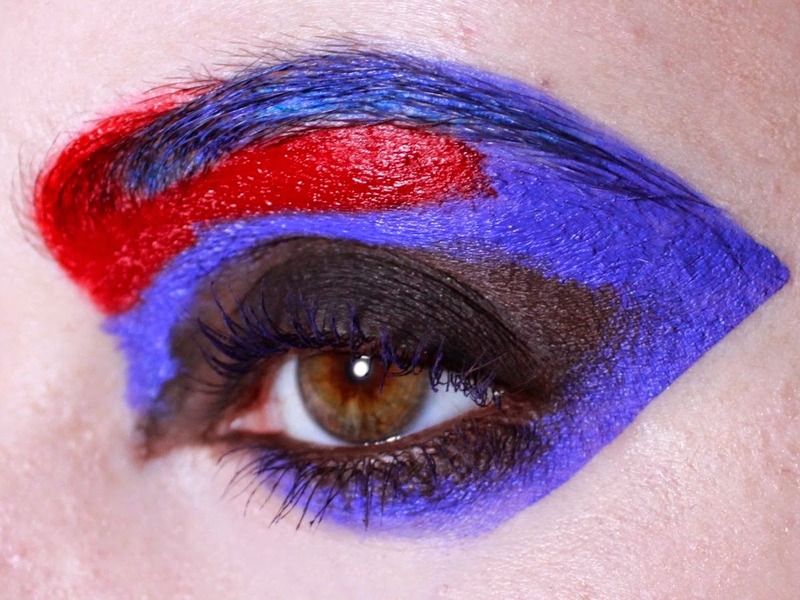 I used the brown to create a squared-off shape, going onto my lower lashline as well, and then went over the middle of the shape with black shadow. 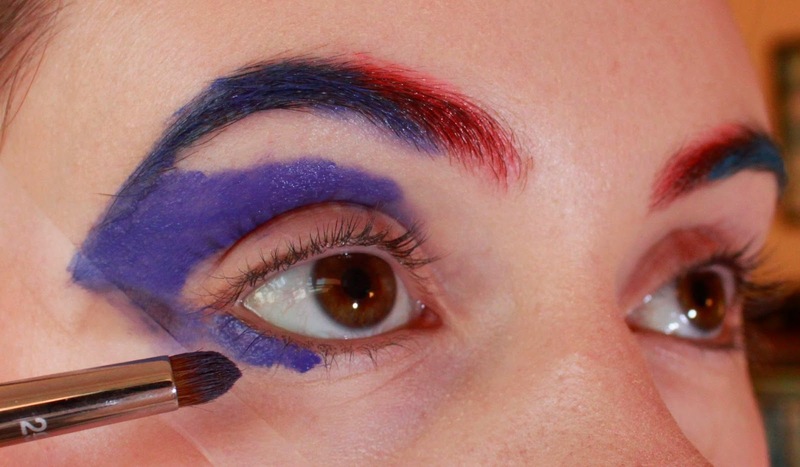 I tightlined with the brown gel liner, applied a navy mascara and called it a day. 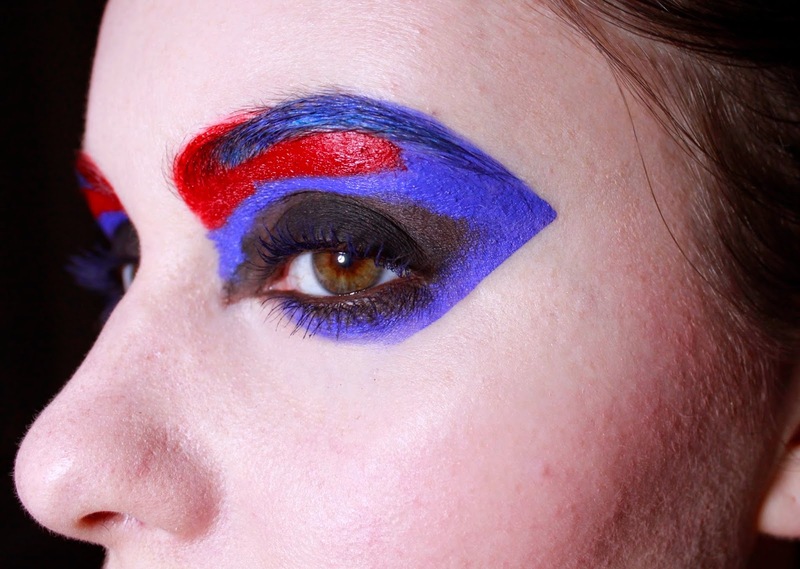 Overall I'm pretty happy with this look, but I feel that there's so much more to explore in this graphic, avant-garde makeup world. To anyone who's also worked with this kind of look, please leave links to the work, your tips & experiences in the comments! And thanks for reading!